Power To The People! Revolutionary Greetings! 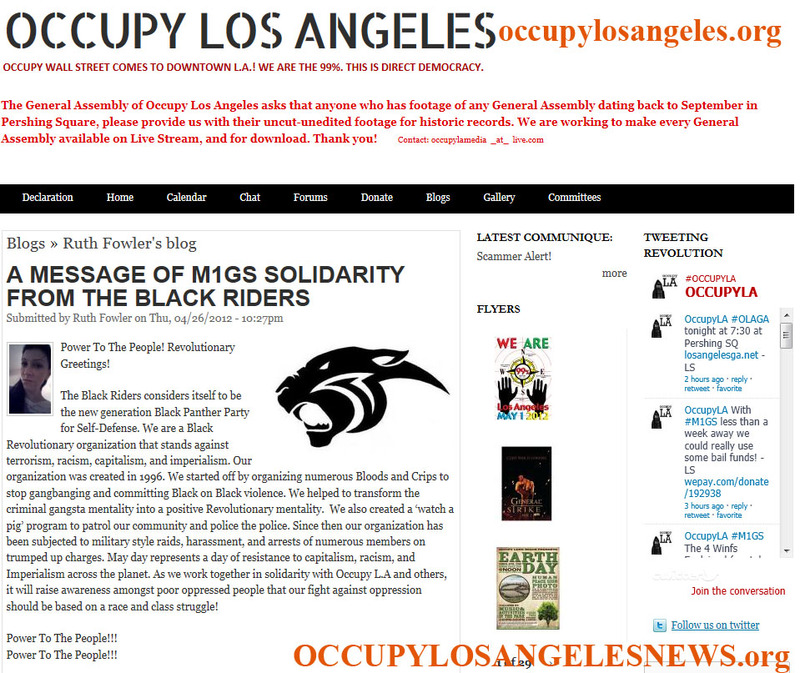 The Black Riders considers itself to be the new generation Black Panther Party for Self-Defense. We are a Black Revolutionary organization that stands against terrorism, racism, capitalism, and imperialism. Our organization was created in 1996. We started off by organizing numerous Bloods and Crips to stop gangbanging and committing Black on Black violence. We helped to transform the criminal gangsta mentality into a positive Revolutionary mentality. We also created a ‘watch a pig’ program to patrol our community and police the police. Since then our organization has been subjected to military style raids, harassment, and arrests of numerous members on trumped up charges. May day represents a day of resistance to capitalism, racism, and Imperialism across the planet. As we work together in solidarity with Occupy L.A and others, it will raise awareness amongst poor oppressed people that our fight against oppression should be based on a race and class struggle! This entry was posted in Cataloged Recent Posts and tagged M1gs. Bookmark the permalink.